It's no big secret that every newborn session is different, whether it is in-home like the following session or in-studio like this session or a combination of both. You never know how the baby will do... will he sleep? Will he cry? Will his siblings want to cuddle him? This was one of those newborn sessions where the (1) the baby slept (2) the baby was happy as a clam and (3) his sisters could not get enough of him... a perfect kind of session! This beautiful family had been through a lot in the weeks prior to the session with one of the children being hospitalized and needing an emergency surgery right after the birth of the baby. But this amazing family powered right through it all and when everyone was recovered, we had one awesome session. Take a look and see! The Woodlands Photographer: Family Celebrates Baby Turning One! If you follow me on Instagram, you know I love visiting Louisiana, especially for a good family session. I recently traveled to back to this beautiful spot in Louisiana to capture a wonderful family and their baby girl who was about to turn one. A few weeks back I did another one year old session and I have to say this again... one year is the perfect time to capture your baby. Give that little another couple of months and they are officially a big kid! This session was so special because the older brother and sister were so loving with their baby sister and wanted to make sure she was the center of attention. That is so rare and so special! I absolutely love this beautiful family. They remind me why I love family sessions! A pair of beautiful sisters recently welcomed home a brand new, tiny baby sister. They were very careful and sweet with their newborn baby and made sure to tell me how special she is. When you meet a group of sisters as kind and gentle as these, you know you are in for an awesome newborn session. I actually shot these as two sessions, first a newborn session about 7 days after the baby was born in my studio and then a separate family session in the family's home about a month after the baby was born. You can really see how much she grew over just three weeks! It's time to mix it up and find some new shooting locations for child and family sessions. I'm always finding fun spots, but this new one might be my favorite. Because this location had a hill suitable for rolling, rocks suitable for throwing and a pond suitable for splashing, it has been approved by the McLendon children. At least for moms, a child's first birthday has got to be the most memorable of birthdays. The twelve months leading up to that special day were filled with all those important firsts, days and nights of round-the-clock care and SO MUCH LOVE. After that first year passes, your baby slowly becomes a big kid, so a child photography session to capture those chubby cheeks and pudgy hands at twelve months is important. This first birthday photo session was so much fun for me because we got into the studio and were able to focus on all the special baby features of this birthday boy and we also were able to capture his sweet, charming personality. If your little one is rounding up on twelve months, schedule your session here ... because your baby will only turn one once! If you follow me on Instagram, you know that I love visiting my home state of Louisiana, especially for a good family session. 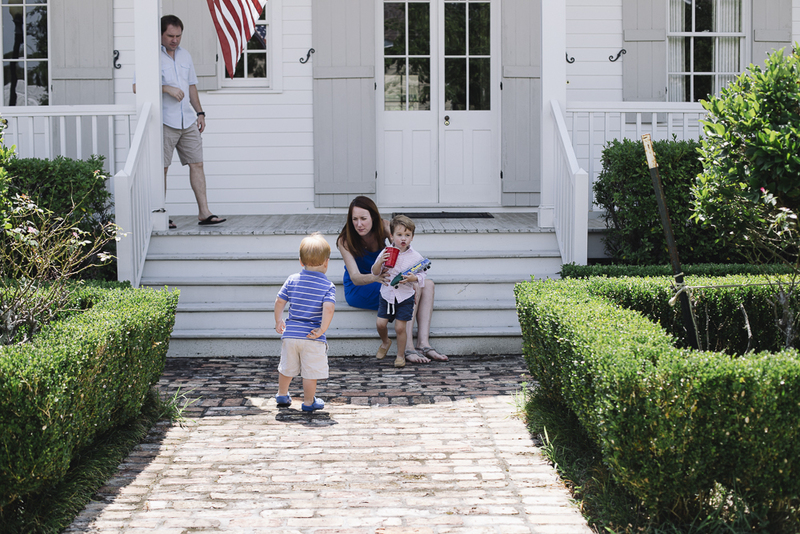 Last weekend I traveled to Natchitoches, Louisiana to shoot a few family sessions at the Oakland Plantation. The rows of beautiful old oak trees and historic plantation home and outbuildings created the perfect setting. The beautiful children of this Louisiana family helped me explore and pick out the perfect spots for all our pictures. We climbed trees, picked flowers, collected acorns and took some amazing pictures. A perfect family session! Shooting newborn sessions doesn't have to mean an indoor session with the heater on full blast. In the South we are lucky to have warmth practically year round, allowing for an outdoor newborn session. We headed out early for this session to avoid the heat, but we didn't expect getting swarmed by mosquito's. Luckily we had mosquito spray and mosquito netting on hand to protect this beautiful baby girl. Everyone was in a happy mood and I made sure to give big brother lots of tasks to help the session run smoothly. With sessions like these, the newborns are usually the star of the show, but big brothers and sisters are what keeps the shoot alive. Find something for them to hold ... I suggest a little rock or leaf. Tell them that it is important and you want to make sure they take good care of it. Tell them in advance that the baby might cry (they know that well enough) and that when it happens, you will need big brother/sister's help in calming down baby. Ask them if they want to take a picture of the baby or mom and dad with your camera. They really love this. Make sure to get some important shots of just them by themselves and just them with the baby. Ask them if there is something cool they can do ... like jump really high, run really fast or make a funny face... and get lots of pictures of that. When the shoot is over, make sure they know they did an awesome job!! Meryl McLendon of All the Gold Photography is a family and child photographer based in The Woodlands, Texas. Meryl loves doing newborn sessions like this one here. So here is how you take some quick but lovely family photos. I took the following pictures in under 3 minutes. So, first, know that toddlers are wild and free. That is great for getting some lifestyle shots of them being wild and free, but if you are looking for some nice posed family shots, my best advice is to have a parent, usually the mom, scoop up the toddler, cuddle him/her and tell them a funny story about the lady taking the pictures. Don't expect to hold the toddler for more than 5 minutes, he/she will get heavy and probably cranky... totally understandable! I keep a lens hood on to give a little extra protection to my lens and because I'm usually shooting in bright sun during the day time. Know what you want to shoot before you go... get on pinterest to get an idea of the kind of shots you want to get at certain spots you are visiting. Camera settings: I usually kept it on about f/4.5, 1/500, iso (pretty dang low for outside). These are my pictures from our family vacation to Hawaii. We were there for my sweet cousin's wedding and I took a ton of pictures. We stayed on Oahu, on Waikiki Beach. My favorite activities were (1) the wedding, of course! (2) Pearl Harbor (3) paddle boarding and swimming in Waikiki (4) swimming on the North Shore and visiting Turtle Cove (5) eating fresh Malasadas (akin to a donut) from Leonards, (6) climbing Diamond Head (extinct volcano), (7) driving a Jeep around the North Shore, (8) the Dole Pineapple Plantation (9) spending time with family. Dreaming of another trip already... I wish! These little guys had a great time scampering through the woods for this fall family session and I had a great time following after them! I can't believe that this sweet family has grown by one big and bouncing baby boy. Between the light that poured in through the trees and the crisp fall breeze whipping through the leaves, we all had a wonderful afternoon taking some pictures and walking the trails of this North Houston nature preserve. I can't say enough good things about this family. They are always smiling and always so sweet with one another. It makes taking picture an easy (and fun!) job. First, let me say hats off to the moms who are busy raising boys. It is not easy, I can tell you that. This special mom, who is a very special friend of mine, does it with style, grace and a calmness I can't even begin to imitate. Shooting pictures of her beautiful family, grandparents and sister included, I am reminded that with all the excitement of family, comes great joy. This was a perfect spring day to day some pictures of a pretty great family! We got lucky with some blue sky weather for this family session. This first day of spring did not disappoint! These two sisters, who coincidentally are the best babysitters you could ask for, have a great bond and it shined through. It was a treat for me to spend my morning with this beautiful family in the city. I have to say these two boys put on a good show for me, chasing and terrorizing each other, but I happen to know they are each other's very best friends. Following them around this morning, I couldn't help but notice they are two peas in a pod. Where one goes, the other goes. What one does, the other does. These are two lucky parents. The boys keep them on their toes, but they also keep them full of joy. This was a family session to a remember! Twas the night before Christmas and all through the house, ran a sweet, wee toddler asking whats this about? With her red stocking cap and her gorgeous blue eyes, she dug under the tree to look for a surprise. She found a farm set from her sweet mommy dear. From the next hour on she was filled with good cheer. Such joy it was seeing this family laugh and play, there is nothing more special on Christmas Eve Day. We managed to squeeze in this city maternity session a few weeks before this beautiful mom-to-be had her sweet baby boy. The rocky cobblestone streets weren't the easy to navigate, but this amazing mama, who is also a dear, dear friend, did it with ease and style. Big brother did a great job too and was most excited when I found the vintage Trabant for him to pose by. I'm pleased to report that he is an amazing big brother these days... I can't wait to share their session as a family of four! A fun fall session with one of my favorite families ever. Once these sweet girls got going, there was no end to their laughing, running, hugging and dancing. I tried my best to keep up with them! We played in the field and took a few pictures until the sun set on this beautiful day. Not a bad way to spend an afternoon! We couldn't have asked for more beautiful leaves this cool, crisp fall day. They came in every color and had collected themselves in big piles perfect for jumping. This sweet girl and her little brother were the best. I never once asked them to smile, they just wore them the whole time. Now I just need to go get myself a scooter like hers!